This week in the war, on 23 January 1944, the Norwegian artist Edvard Munch died in Oslo. As he evolved as an artist, his work became more violent, emotional, and filled with symbolism. The public was sometimes shocked. His 1892 exhibition in Berlin was closed on the day after opening day. 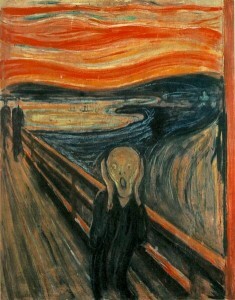 The Scream is his most well-known work. Throughout the Second World War, Edvard Munch steadfastly refused to collaborate with Norway’s pro-Nazi (Quisling) government. This entry was posted in World War II and tagged Edvard Munch, Norway, Quisling, The Scream. Bookmark the permalink.